I own a DSL 1H head and interested if it already has a buffer in the FX loop out or I need to add an external one. Since purchase amp always had a hum unless I touched strings. Last month the amp spiked when I turned Standby ON. Since then lost power on Classic channel and selector switch on head would not change channel, but footpedal works. I returned to Sweetwater for repair/replacement immediately. I received back stating "Reverb PCBA pins were lifted halfway off Main, glued in place. Bias the output tubes...". At this time I purchased Gibson cables CAB12-BL thinking the hum from bad Sweetwater cables supplied. Still have hum at 1/4 volume, min Gain setting and the Channel Select on head still does not work. It used to, and hum acceptable at low volume. Is this correct, can I get replacement? Hi I'm trying to register my new code 25 but can't find the require serial number. I cant find my code 25 soundcard in cubase elements 8 !! Do I need a driver ? I'm sure this question has been asked before, but just thought I'd try. Is there a capacitor I can take out, or something I can do to eliminate the volume swell when changing channels? Hiya! Can anyone enlighten me about tone pots in Marshall valvestate 2000 avt20 combo. need to change middle desperately, and maybe others. cheers! Bought in 1996, needs a new speaker, what would be an equivelent speaker today. It has An Eminence 15 inch 8 ohm speaker, that's all the information I can Find. So the amp is great and all, except for the noise introduced via the USB interface and the lack of user-made patches and stuff. So when can we expect a software update to be released? It's been quite a while since the amp was released and I would very much appreciate a fix. Also, will more amp models be added down the line? Cheers. + Downloading https://my.marshall.com/downloadfiles/firmware/Application Files/MarshallFirmwareUpdateUtility_1_0_0_13/Newtonsoft.Json.dll.deploy did not succeed. + Unable to read data from the transport connection: An existing connection was forcibly closed by the remote host. 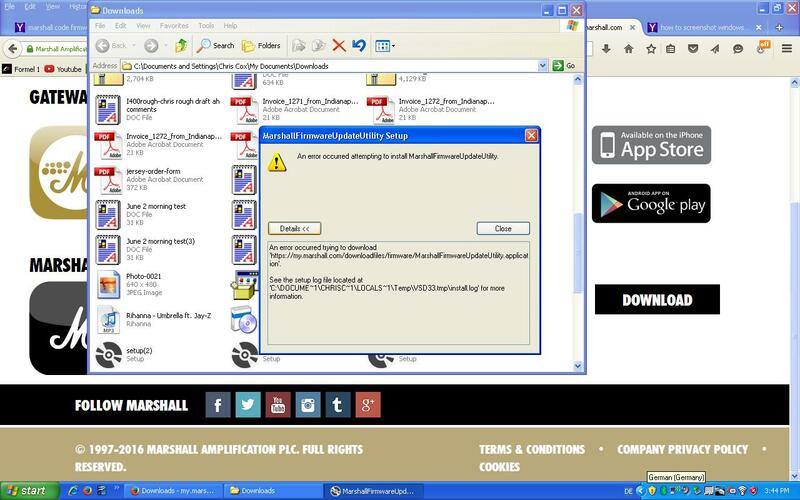 * [9/20/2016 6:43:07 PM] : Activation of https://my.marshall.com/downloadfiles/firmware/MarshallFirmwareUpdateUtility.application has started. * [9/20/2016 6:43:12 PM] : Processing of deployment manifest has successfully completed. * [9/20/2016 6:43:12 PM] : Installation of the application has started. * [9/20/2016 6:43:17 PM] : Processing of application manifest has successfully completed. * [9/20/2016 6:43:23 PM] : Found compatible runtime version 2.0.50727. * [9/20/2016 6:43:23 PM] : Detecting dependent assembly Sentinel.v3.5Client, Version=3.5.0.0, Culture=neutral, PublicKeyToken=b03f5f7f11d50a3a, processorArchitecture=msil using Sentinel.v3.5Client, Version=3.5.0.0, Culture=neutral, PublicKeyToken=b03f5f7f11d50a3a, processorArchitecture=msil. * [9/20/2016 6:43:23 PM] : Detecting dependent assembly System.Data.Entity, Version=3.5.0.0, Culture=neutral, PublicKeyToken=b77a5c561934e089, processorArchitecture=msil using System.Data.Entity, Version=3.5.0.0, Culture=neutral, PublicKeyToken=b77a5c561934e089, processorArchitecture=msil. * [9/20/2016 6:43:23 PM] : Detecting dependent assembly WindowsBase, Version=3.0.0.0, Culture=neutral, PublicKeyToken=31bf3856ad364e35, processorArchitecture=msil using WindowsBase, Version=3.0.0.0, Culture=neutral, PublicKeyToken=31bf3856ad364e35, processorArchitecture=msil. * [9/20/2016 6:43:23 PM] : Detecting dependent assembly System.Core, Version=3.5.0.0, Culture=neutral, PublicKeyToken=b77a5c561934e089, processorArchitecture=msil using System.Core, Version=3.5.0.0, Culture=neutral, PublicKeyToken=b77a5c561934e089, processorArchitecture=msil. - Downloading https://my.marshall.com/downloadfiles/firmware/Application Files/MarshallFirmwareUpdateUtility_1_0_0_13/Newtonsoft.Json.dll.deploy did not succeed. - Unable to read data from the transport connection: An existing connection was forcibly closed by the remote host. Marshall DBS 27115. What is nearest replacement speaker . The original is Eminence Marshall labled 151151 (15 inch 8 ohm) cannot find the spec of the original.I have contacted Marshall but no response. how do i hook up cab A and B? New to amps, would like to make a purchase, don't quite understand the difference between dual & single channel amps. They both have two inputs on the front usually hi & low, and some have a "send" & "return" on the back. Also, If one is using effects boxes, would they plug their guitar into one of the inputs in the front, and then how is the configuration for the effects boxes using the loop of send & return along with an adjustable knob, like on the Marshall Astoria Dual Combo? What is the differences between using input hi or low on the front of the amp, and which one is better for maximum use of the tube overdrive? Couldn't update on my mac, so went to my PC and still having issue running the software. How to I get the Code to update its firmware. My JVM410C Combo which is only 7 months old has started making intermittent but persistent load crackling and popping making it unuseable. How should I go about getting this repaired or replaced under the warranty? Hi, I bought a Marshall DSL40C amp in July from Gearnuts (www.gearnuts.com). The amp has been working great until yesterday - a crackling buzz began and then I heard a pop and saw a small flash of light. It looks like the tubes are blown out. How do I get these replaced under the warranty? Hi, what brand and model are the best replacement tubes for the jvm410c? I would like to have some alternatives to winged c el34 tubes? would it be possible to do something like a phrase recorder in the app, maybe as part of the song player to capture/record ideas and riffs to save for playback to jam to or email to yourself as say an M4a.